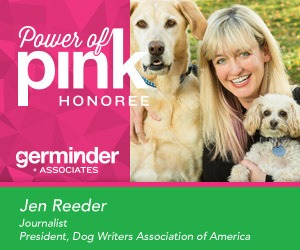 (Kansas City, Mo and New York – July 2, 2018) Germinder + Associates has named Jen Reeder, journalist and president of the Dog Writers Association of America (DWAA) as the sixth #Germinder20 #PowerofPinkHonoree and the first journalist to receive the award. The announcement comes immediately after the agency celebrated its 20th Anniversary Day on July 1, 2018. Reeder has designated Green Dogs Unleashed, which rescues dogs (and other animals) with special needs and trains them to be therapy dogs to receive the $1,000 Germinder Honoree donation. Jen Reeder and her brother Brian typing with their dad, Tom Reeder, on an IBM Selectric typewriter in 1976. Reeder comes from a family of wordsmiths, as she says, “I always say that I grew up ‘drinking writing from two straws’ because there were successful writers on both sides of my family.” Her father, Tom Reeder, is a retired TV comedy writer. Her mother’s father, Harrison Stephens, was a newspaper reporter and editor. Her godfather is a retired television writer, and everyone in her family is an avid reader. All have encouraged her passion for reading and writing, which go hand in hand. “I still ask my dad for feedback on some of my bigger stories before I submit them, and he’ll offer constructive criticism down to a missing hyphen. There’s no question: he’s made me a stronger writer. I’m grateful to have received so much love and support throughout my life,” said Reeder. In accepting the Honoree award, Reeder commented, “I am incredibly honored to be named a Germinder Power of Pink Honoree. Lea-Ann and her team at Germinder + Associates do so much for pets and pet writers – including donating $1,000 in the name of each honoree to a worthy nonprofit! I’m so grateful for all she does for the pet community and for the Dog Writers Association of America. Congratulations on twenty amazing years and cheers to the next twenty! Jen Reeder (center) with her parents Sally and Tom Reeder at the 2016 DWAA banquet. Reeder’s commitment to public relations. A public relations firm representing writers and journalists is a daunting task. It helped forge a partnership of trust during challenging times. It is exceptionally gratifying given solid relationships with journalists has been a hallmark of the firm since 1998. Reeder is a freelance journalist who specializes in pet and lifestyle features. Her first job writing about animals was for the World Wildlife Fund in 1994, but since then, her focus has shifted to man’s best friend. Reeder’s articles and essays about pets have been published by BBC News, The Daily Beast, Family Circle, Modern Dog, The Christian Science Monitor, PBS’s Next Avenue, AKC Family Dog, Today.com, HuffPost, Just Labs Magazine, the American Animal Hospital Association and the Sierra Club. Her rescued dogs, Rio and Peach, provide plenty of story ideas. She is also the founder of the nonprofit Rock 1 Kidney. #Germinder20 #PowerofPinkHonorees are announced and are given the opportunity to designate a $1000 donation to be made in their name through Germinder’s 20th Anniversary Fund Giving Back program to a not-for-profit organization of their choice. To date Honorees named and their designated donations include Debra Horwitz, DVM, DACVB (Missouri Humane Society), Heidi Lobprise, DVM, DAVDS (Lutheran Church Charities K-9 Comfort Dogs), Elizabeth Colleran, DVM, MS,DABVP (Winn Feline Foundation), Dan Richardson, DVM, DACVS (Stormont-Vail Foundation Care Line) and Manolita Moore (The Pixel Fund). Additional Honorees will be named throughout 2018. Links to personal interviews with each honoree are also featured here. #Germinder20 #ThePowerofPink was announced in January 2018 as part of the celebration of Germinder’s 20thAnniversary Year. The women’s storytelling initiative highlights the founder’s story and also shines a spotlight on 20 leaders whose stories have touched and inspired Germinder to success. Initial donations have been made to The Weill Cornell Breast Center at the Weill Cornell Medical College/New York Presbyterian Hospital, an integrated, multi-disciplinary care center where Germinder was treated for breast cancer five years ago. Another recipient is the Clara Goy Foundation in memory of Germinder’s brother-in-law, Gene Melleno, a girl’s high school basketball coach who passed away Jan. 1, 2018. Other donations have been made to the Jan Hus Community Outreach Program in honor of Germinder’s immigrant great-grandmother Marie Therese Kacin and to the News Literacy Project. Once again, Germinder & Associates has been named agency of record for the esteemed Dog Writers Association of America (DWAA). Founded in 1935 by eight editors and publishers invited to the Westminster Kennel Club Dog Show, the DWAA has become the most recognized professional writing association devoted to man’s best friend. DWAA President Jen Reeder said she is delighted that Germinder has agreed to continue the collaboration. In additional to sponsorship activities, the agency will provide strategic counsel, publicize DWAA events and publish news about members’ books on its Goodnewsforpets.com platform. The agency has already begun outreach to special award sponsors and will promote the DWAA’s annual writing contest and awards banquet, scheduled for Sunday, February 10, 2019 at the New Yorker Hotel in Manhattan. “We are thrilled to return as the AOR for DWAA in our 20th anniversary year and be recognized for our work. DWAA is an organization near and dear to me personally. We look forward to achieving even more success together with this organization of highly skilled dog writers, bloggers and journalists,” said Lea-Ann Germinder, APR PRSA, President & Founder, Germinder + Associates and Editor & Publisher of Goodnewsforpets.com. The Dog Writers Association of America is the most recognized professional writing association devoted to dogs. Founded in 1935, the DWAA has grown from eight founders to over 500 members, including journalists, authors, bloggers, publicists, photographers, illustrators and media personalities. Under the umbrella of the human-canine bond, members cover dog competitions, health, training, rescue, pet fashion, veterinary research, working dog organizations, animal welfare legislation, fundraisers and many other topics. For more information, visit: www.dogwriters.org. Goodnewsforpets.comTM combines an award-winning website and social media channels to curate news of interest and importance to pet parents, veterinary professionals and the pet industry. Editorial, contests, sponsored content distribution and advertising is available. GNFP DigitalTM provides a wide range of digital services including digital audits, standard or custom infographics, topic specific modules and branded content implementation. The custom digital content development and distribution services are offered for national brands, veterinary practices and other niche markets.